So far in 2011-12, the Jets have had the upper hand on home ice. 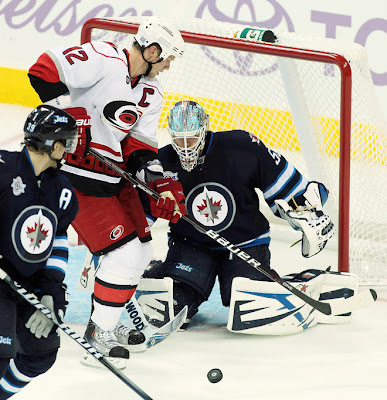 After a 5-3 win against the Carolina Hurricanes Saturday night, the Jets improved their record at the MTS Centre to 2-1-0. In those three games, the Jets have been outscored 8-9, but have seen increases in their offensive output last week. After scoring only five goals in the first three games, the Jets had 11 goals in their last four games. While giving up 12 at the same time, the Jets have found their go-to offensive players throughout the first two weeks of the season. Sophomore Alexander Burmistrov leads the team with six points (two goals, four assists) through the first seven games, while Kyle Wellwood (five points), Nik Antropov (five points), and Tobias Enstrom (four points) have all been great surprises chipping in on offense. Saturday night saw Evander Kane notch his first goal as a Jet as he has had a rough start, with a -3 rating through six games. Also figuring into the scoring was captain Andrew Ladd with his second of the season and Jim Slater, who has also been a surprise offensively, with three goals in six games. The Jets will need more out of their top line of Blake Wheeler-Bryan Little-Ladd however tonight if they are to beat the Rangers and their quick transition game. Wheeler has only two assists in seven games, while Little has only one assist in seven games. Both are minus players as well. According to Jets head coach Claude Noel, he may be giving Chris Mason the benefit of the doubt when it comes to starts coming up after he held the fort as the Jets came back Saturday night. However, according to Yahoo! Sports, Ondrej Pavelec has an impressive 2-0-1 record against the Rangers with a 1.30 goals against average while Mason is 3-0-0 with a 2.46 goals against average. May the best goalie win, but as for now, look for Mason to get the nod after his eighteen save performance against Carolina in his first win as a Jet on the weekend. Monday night will be the first game we will not see Mark Scheifele in the lineup as the Jets sent him back to the Barrie Colts of the OHL. Scheifele had one goal through seven games. Game is available on TSN-Jets and the MSG Network in New York.